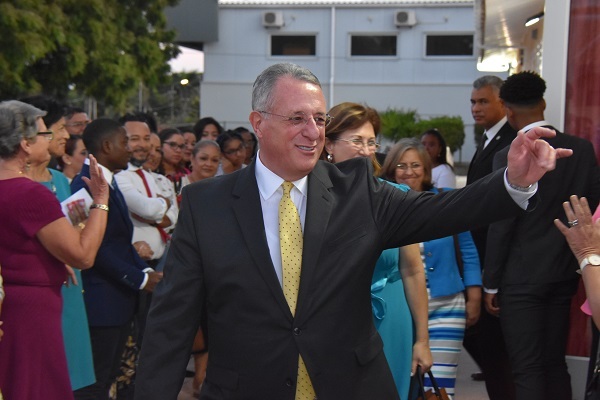 WILLEMSTAD - A member of the Quorum of the Twelve Apostles of the Church of Jesus Christ of Latter-Day Saints visited the island this week. Elder Ulisses Soares was on a special assignment. He was on the island to rededicate Curaçao for the preaching of the gospel. Elder Soares also used to opportunity to meet with the missionaries serving in Aruba, Bonaire and Curaçao. There are 22 missionaries serving on the ABC islands. The meeting was also broadcasted to the missionaries serving in Guyana and Suriname. Elder Soares took the opportunity to remind the missionaries why they are on their missions. He spoke about their service to the people in the mission. The Apostle shared various anecdotes and scriptures to motivate the young man and women, and the missionary couples to continue their service. After the meeting with the missionaries, Elder Soares presided over another meeting. This one was historic for most of the members of the Church on the island. Most of them have never seen a General Authority before. Many observed that it was a blessing to have this leader on the island. At the end of the meeting, Elder Soares rededicated the island for the preaching of the gospel. This is customary in the church, especially when it will open a new area for the preaching of the gospel. Curaçao was already dedicated in 1981 by Elder Robert E. Wells, who was a Member of the Quorum of the Seventy of the Church. But after all these years, the church has not really seen a major growth on the island, compared to other countries in the region. Currently there is even a temple in the Dominican Republic. One is under construction in Haiti and another has been announced which will be constructed in Puerto Rico. During the meeting with the members, two pioneer members of the island spoke. Ingeborg Zielinski Reni who was the first member of the church on the island shared her story about how she started the work on the island. Yvonne Antersijn, who was the first native woman to be baptized into the church, also spoke and shared her experiences. According to the website of the Church of Jesus Christ of Latter-Day Saints, Elder Ulisses Soares was sustained as a member of the Quorum of the Twelve Apostles of The Church of Jesus Christ of Latter-day Saints on March 31, 2018. He had been serving as a General Authority Seventy since April 2, 2005 and was named a member of the Presidency of the Seventy on January 6, 2013. He served previously as a counselor in the Africa Southeast Area, President of the Brazil Area and as a counselor in the Brazil South Area. Elder Soares was accompanied by Elder Walter Gonzalez of the Quorum of the Seventy.